Hotsumisakiji Temple is the twenty-fourth of the 88 temples of the Shikoku pilgrimage. Hotsumisakiji, means Extreme cape Temple. 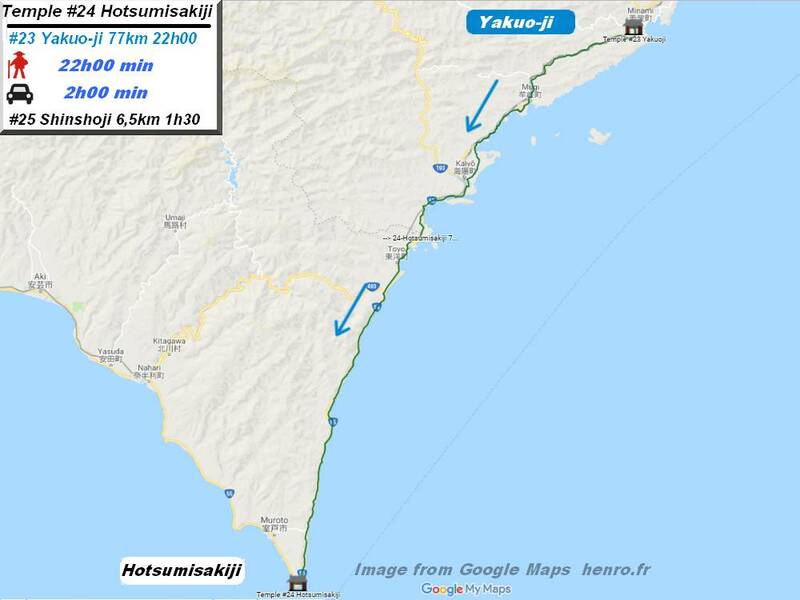 It is at the end of a 75 km walk (and about 3 days) from Yakuō-ji Temple, along the coast (on Route 55) that you will reach Temple 24: Hotsumisaki-ji. 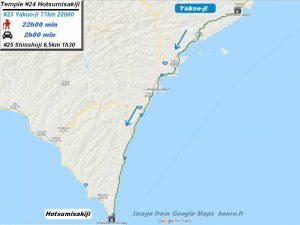 On the way, 22 kilometers before temple 24, you will pass a small temple (Bukkai-an) in honor of the monk Bukkai Shōnin (1710-1769) who built a hut for pilgrims near this site.At this time, this part was extremely difficult because there were no inn along this road. You will can find toilet and water at this temple. At the foot of the temple you will find a monumental statue of Kūkai. 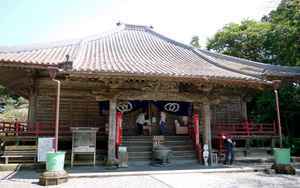 Kukai came to the current location of the temple for the first time at the age of 19. He spent most of his time singing sutras and meditating in a cave (Mikurodō) to reach his goal of enlightenment. Some say he would have had enlightenment here for the first time. He returned there at the age of 33 to found Hotsumisaki-ji Temple and carved a statue of Kokuzō Bosatsu. The legend says that it's here in the cave during he was meditating and observing the sky and the sea that Saeki Mao took the name of Kūkai in reference to the sky (Kū) and the sea (Kai). According to legend, the population suffered from very strong winds in this area. Kūkai went to a cave near the one where he had meditated.The wind turned against him and the rocks then took the form of a corkscrew.